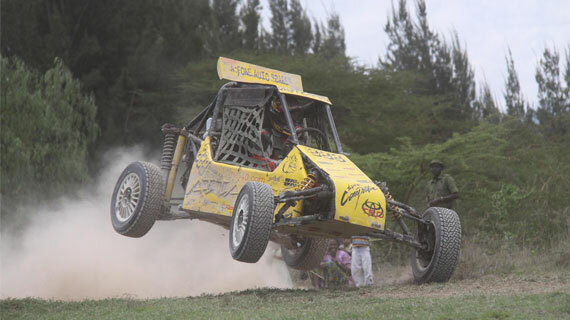 The opening round of the KCB Kenya National Autocross Championship 2017 came to a dramatic end at Cheita Farm over the weekend with second generation drivers dictating the pace in their respective classes. And it was double celebration for the Bailey family with Ryan's mum Gillian crowning her autocross debut with victory in the Two Wheel Non Turbo class. "Yesterday (Sunday) was definitely my best day of racing ever," quipped Ryan, adding: "I completed my first race in the junior class and finished first. I also narrowly set the fastest time of the day beating all the buggies on times. It was a great event and massive thanks to my racing team PAC." Notable absentee in the junior class were Don Smith siblings- Rio and Sean -who are expected to unveil their new Vitz 1500cc machine soon. Defending Four Wheel drive turbo champion Azar Anwar proved that age is nothing but a number. Azar, 63, won his class with the fatest overall heat ofbthe day by bearing the younger generation of drivers to a breathtaking podium dash. Azar posted the fastest overall time on the best of three heat total. Gillian savored her debut in Two Wheel Drive Non Turbo class which saw her defeat Tejas Hirani. Tejas drove a bambino buggy and couldn't match Gillian's time in a slower machine. Nikhil Kapoor was all smiles and this is what he had to say: "Its was an amazing track. Very well organized. As for me,the buggy developed some issues on the practice heat but with the consent of the officials, I was allowed to share a buggy with Shaz Esmail. Kudos to KCB and Nyanyuki for a great event"